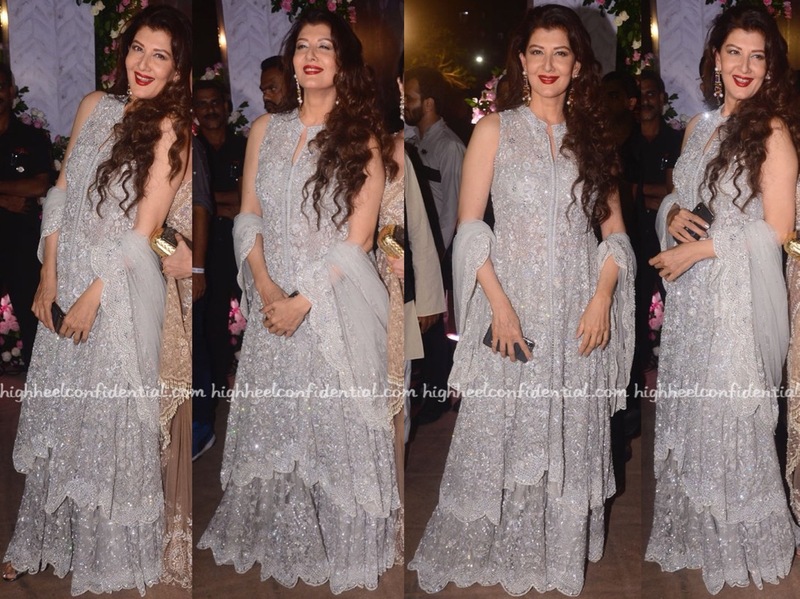 Like Sangeeta, Sophie too went with a silver-grey color, hers being a Manish Malhotra sari of course. Wearing her hair in tight curls, she rounded out the look with diamond jewelry, pink lip color and a Dior clutch. She made the sari work for her but, we do wish she had worn her hair differently. Wearing a Mayyur Girotra anarkali with jewellery from Anmol, Divya attended Poorna and Namit’s wedding reception on Saturday evening. With the skirt having that big brocade pattern, wish the bust had been plain to balance out the look. Overall, it looked really busy. Did you like the anarkali? Wearing a lime green Abu Jani Sandeep Khosla long anarkali, Sonakshi attended Poorna and Namit’s wedding reception on Saturday evening. For a day event, this outfit would’ve worked better but for the evening affair, it came off looking too flashy, especially under all those camera flashes.